Good reviews are always lovely to receive, but sometimes you receive one which means more than most. This, from the almost legendary Jacqueline Simpson, sometime President of the Folklore Society, Visiting Professor of Folklore at the Sussex Centre of Folklore, Fairy Tales and Fantasy at the University of Chichester, collaborator with Terry Pratchett on The Folklore of Discworld and co-author with Jennifer Westwood of The Lore of the Land: a Guide to England's Legends, from Spring-heeled Jack to the Witches of Warboys - is truly special. So here it is, from the latest issue of 'Folklore' and please forgive me for a little trumpet-blowing. ‘Fairy tales’, writes Katherine Langrish, ‘are emotional amplifiers . . . [They] work as music does,directly on our feelings’ (197). This collection of her essays (plus three poems) illustrates the psychological subtlety and poetic force of her own responses, and will surely guide readers towards similar sensitivity. 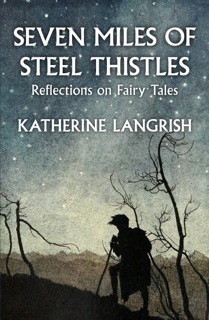 She can also, on occasion, cast light on relationships of sources and analogues, notably in her discussion of the ballad of ‘The Great Selkie of Sule Skerry’ (158–87), but her main concern is usually with the deeper themes which she perceives as underlying fairy-tale plots—such themes as time, hunger, death, and rebirth. Alongside these, she can provide sudden sharp insights and speculations which even if unprovable will remain memorable and interesting. For example, in an essay on water spirits she wonders whether the fact that a stick plunged into water will appear broken although it is in fact unharmed could have inspired the prehistoric custom of bending or breaking weapons before throwing them into sacred pools (262). She boldly tackles even the apparently distasteful tale of ‘The Juniper Tree’, which ‘acknowledges terrible evil but ends in hope’ and which ‘haunts’ her (145). Of course, one’s own responses may not always match hers; for example, she has never met anyone who likes the tale of ‘Bluebeard’ (198),whereas I enjoyed it as a child—largely, as I recall, for Sister Anne’s recurrent rhyming reply, ‘Je voie l’herbe qui verdoit et la route qui poudroit’ (I see green grass growing, and on the road dust blowing). 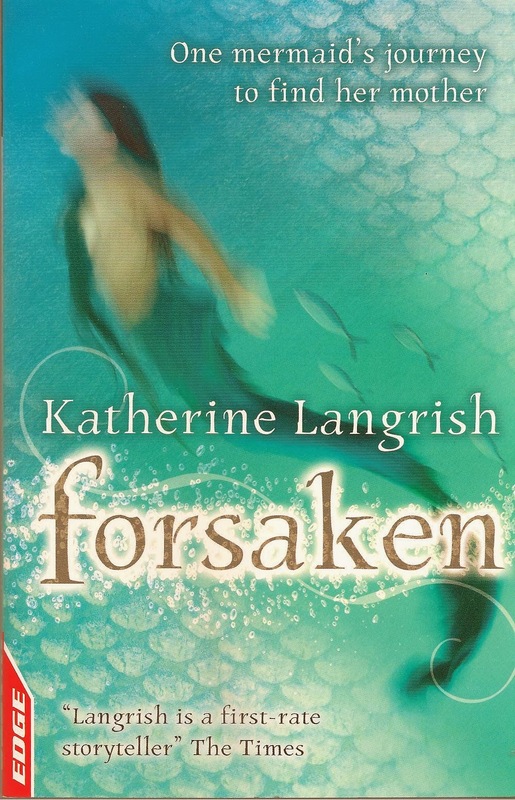 We are all subjective readers, and I am grateful to Katherine Langrish for showing how fruitful this can be. 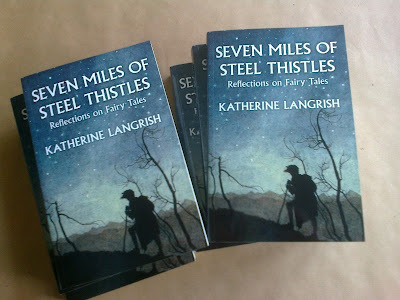 as much information, to be obtained from Seven Miles of Steel Thistles. "It's not just an [insert genre] book..."
I'm still engaged in writing the next book, so here's one from the archives - from three years ago. Still relevant though. 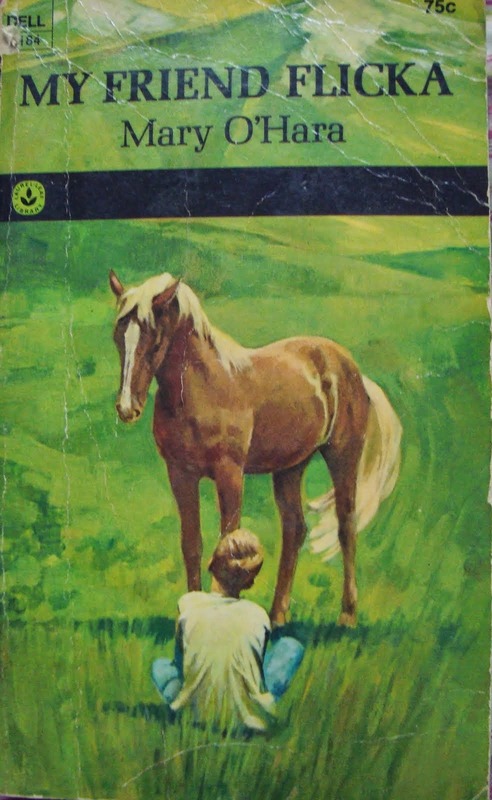 It’s the third in a series of horse books for children, 'The Horses of Oak Valley Ranch', by Jane Smiley, the Pulitzer Prize-winning author of ‘A Thousand Acres’. 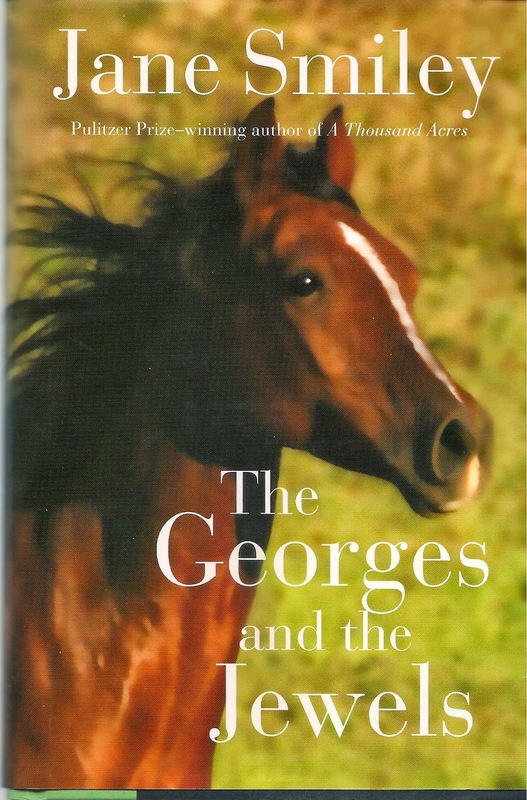 I have the first two in the US hardcover editions: ‘A Good Horse’ and ‘The Georges and the Jewels’. 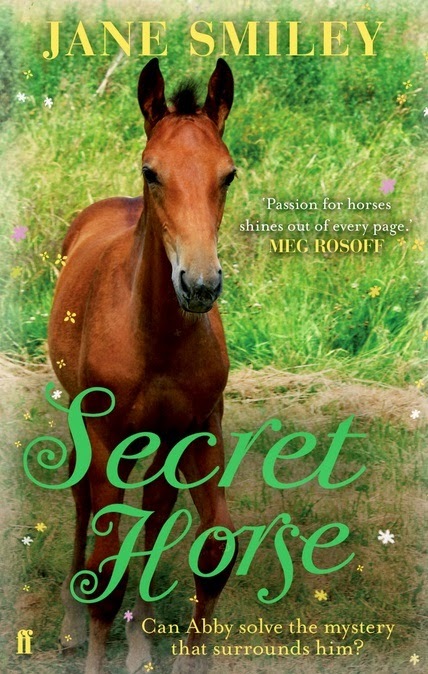 I do wish same-language publishers would keep to original titles, but Faber & Faber in the UK has changed them to the more generic ‘Secret Horse' and ‘Nobody's Horse’, and in the process has designed covers that practically guarantee no-one except pony fanatics will ever read them. The US covers are way classier. But that's publishers for you. And who knows if any of them sold well? I mean, take a look at the UK cover of 'Mystery Horse' –‘True Blue’ in the States – the gorgeous galloping white horse against the blue sky, with its blue foil title and little blue and pink foil flowers scattered around. Any pony-mad child would want it. But then, well, then they might find this is more than your average pony story. Set in 1960’s California, the books follow the story of a young girl, Abby, growing up in a fundamentalist Christian family. Her father is a horse trainer and dealer, and Abby spends much of her free time outside school helping him work with the horses. Her mother and father are loving parents but her father in particular is unbending in his outlook, and her elder brother Danny has left home after a bitter row. Smiley’s treatment of the family and its predicament is sympathetic and nuanced. As Abby is the narrator, we see her father through her eyes: stubborn, hardworking, fair according to his lights, rigid in his beliefs but – over the course of the first three volumes – able finally to compromise and come to terms with his son’s independence. In the meantime Abby begins to navigate her own way through life. Observing her father’s strengths and weaknesses, she learns how to trust herself, to question her parents’ views without loss of love or respect, and to come to her own conclusions. Mom reached over and smoothed my hair. Dad didn't say anything, and we drove the rest of the way home. 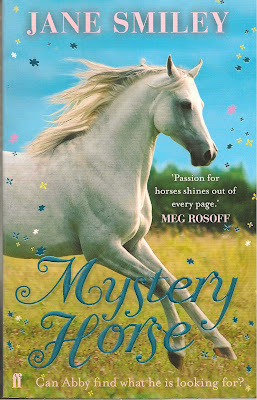 As if all this wasn’t enough, ‘Mystery Horse’/’True Blue’ is also a remarkably good ghost story: unsettling, spooky, beautiful and ultimately all about Abby, so that the ghostly bits are integral to the narrative and not some tacked-on extra thrill. As an adult, I love these books. I love the detailed and thoughtful accounts of grooming, training and riding these horses which – because they are all for sale – often don’t even have individual names, in case anyone gets too attached to them. I love the fact that there can be whole chapters set in church – the ‘church’ which is all this small faith group can afford, a featureless rented space in a shopping mall. I love the thoughtfulness with which Jane Smiley navigates Abby’s world. The ways in which school and home life clash: textbooks which mention evolution and therefore cannot be shown to Daddy, or Mom’s horror on discovering that in a history lesson, Abby has been constructing cardboard models of Spanish missions. It’s done with a light, almost comedic touch, but can become serious. ‘“So,” said Daddy' [to Daniel, at the beginning of their quarrel]. “Some boys who taught you to take the holy name of the Lord in vain are going to pick you up and take you to see a fantasy movie about evil and hate. Am I right?”’ Other kids are allowed to go to movies and listen to the Beatles. Abby doesn’t exactly miss these activities, but she knows that not having them makes her different. I love all of this. But would a child? It’s true that there are many pony books, school stories or adventure stories which are hardly great literature, however that may be defined. But not every plain old novel is great literature either. 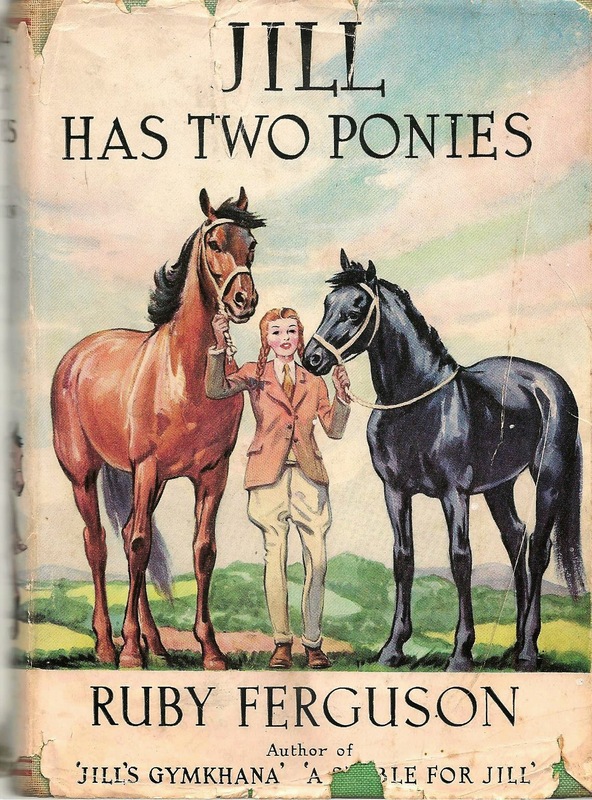 I’m not denigrating the many, many pony books I read as a child just because, as an adult, I no longer find them so interesting. The ‘Jill’ books by Ruby Ferguson, for example, kept me enthralled when I was ten or eleven. They are fun, they are lively. They do one single thing: tell an entertaining story and tell it well. That is good in itself. But there are books which do more, which are multi-dimensional. Mary O’Hara’s ‘My Friend Flicka’ and ‘Thunderhead’ and ‘Green Grass of Wyoming’ are multi-dimensional. They offer a richness – of characterisation, of description, of emotional intelligence – which the ‘Jill’ books don’t have and never aspired to. KM Peyton’s ‘Flambards’ and ‘Fly By Night’ and ‘The Team’ are multi-dimensional. In the genre of ‘school story’, Enid Blyton’s ‘Malory Towers’ and ‘St Claire’s’ stories offer the child reader excellent ripping yarns, unashamed fantasies of the fun and frolics of boarding-school life. But Antonia Forest’s school stories ('Autumn Term' and its sequels) are multi-dimensional. They offer more: depth of character, growth, change, consideration of topics such as religion, censorship, responsibility, and the unwitting cruelty of schoolchildren to persons they dislike. And yes, I loved all of them indiscriminately, but the ones I read and reread and have kept reading into adult life are the multi-dimensional books. I knew even back at the age of eleven or twelve or thirteen that I was getting far, far more out of ‘My Friend Flicka’ than I was getting out of ‘Jill’s First Pony’. Mary O’Hara was talking about stuff that was important to me. My father and my brothers, much as they loved each other, used to argue. There were misunderstandings, jealousies, quarrels which sometimes burst around us with the violence of a thunderstorm. In ‘My Friend Flicka’ and its sequels, the dreamy boy Ken and his impatient, practical father are also negotiating a difficult relationship punctuated by storms. 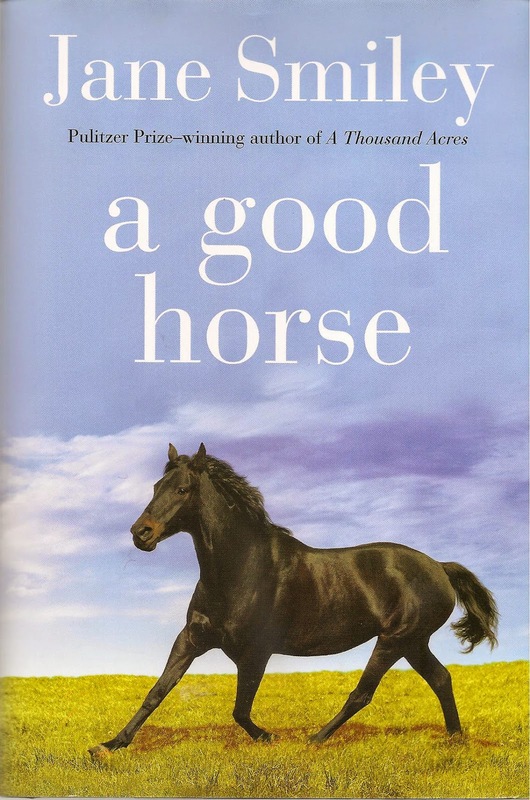 That story intertwines with the story of Ken’s love for his little horse, and is equally important. Maybe some children don’t like these multi-dimensional books, maybe some children – perhaps even many children? – become bored, impatient, wanting simply to get on with the story. But there will be other children who want more, who are already thinking, already asking questions about life, who will appreciate finding these questions taken seriously in the middle of a book ‘about’ horses or school. A multi-dimensional book always gives the reader more than they expected. Because if you do, if everyone who ever reads and loves a ‘genre’ book feels they have to rescue it from its category before praising it, then what is left? Every category of books – novels, children’s fiction, popular science, you name it – contains a multiplicity of less or more able writers, and we should remember it's better do something simple and do it well, than to aim high and fail. If somebody says, as someone recently said to me, ‘But Ursula Le Guin’s books aren’t really fantasies’, how is that a compliment to Le Guin? She chose to employ her wonderful talents in the field of sci-fi and fantasy. That is where she belongs. All it really proclaims is the reader’s embarrassment at having enjoyed a book belonging to a genre which they believe – in spite of the evidence before their eyes – to be second-rate. Either we need to do away with categories and genres altogether – which isn’t going to happen – or we need to stop being embarrassed and apologetic, and be ready to recognise and celebrate good work in whatever field it happens to grow. Loud and clear: there are excellent pony books, there are excellent school stories, there are excellent fantasies, and there are excellent children’s books. Their excellence is no different in kind from that of any other writing. So, yes! 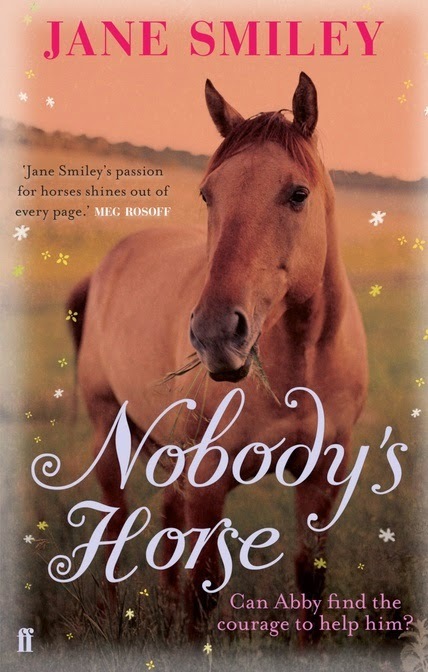 Unsurprisingly, Jane Smiley's series of horse stories is truly excellent. Any child or adult who picks them up will learn much – about horses, and about life. 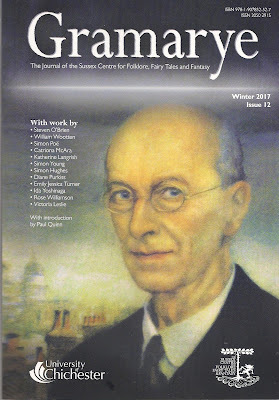 I am delighted to be in the new issue of GRAMARYE, the journal of the Sussex Folklore Centre and as usual an unmissable read for folk lore and fairy tale enthusiasts.This issue contains three marvellous articles on Arthur Rackham - whose self portrait adorns the cover. In 'A Walk Through Rackham Land,' Steven O'Brien takes us on a ramble through the deep history of the artist's beloved Sussex countryside. 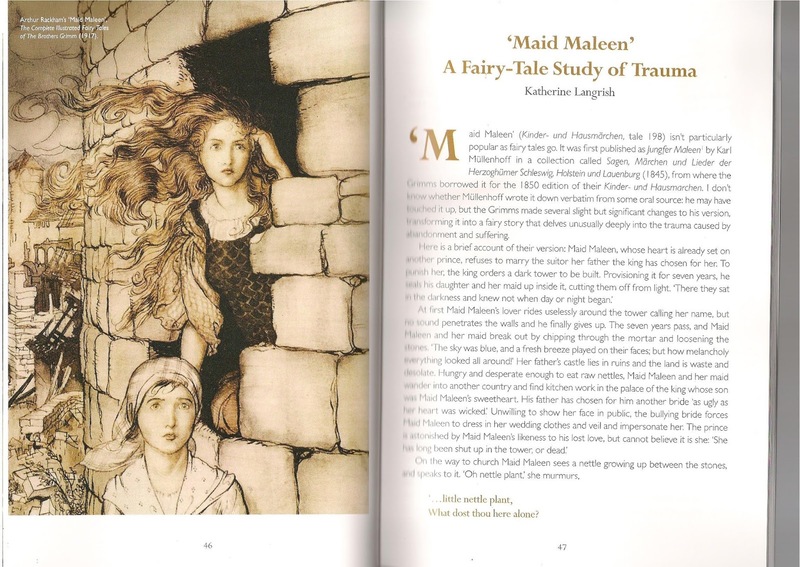 William Wootten tells how Rackham's silhouettes inspired his own verse narrative of The Sleeping Beauty, and Simon Poë interestingly compares Rackham's illustrations to 'Puck of Pook's Hill' with those of H.R. Millar. Catriona McAra contributes an article on fairy references in the work of the surrealist Leonora Carrington, while in 'Herne, the Windsor Bogey', Simon Young takes us into Windsor Great Park on a search for the controversial history of the great oak-tree of Herne the Hunter. 'The Signing Wife' is an original translation by Simon Hughes of a thought-provoking Norwegian folktale collected by Peter Christen Asbjørnsen. Finally, Diane Purkiss adds a touching and lyrical account of her childhood love for Andersen's story 'The Snow Queen'.